Did The Queen Send ‘Coded Messages’ To Trump With Her Jewellery? The more the Queen does these days, the more I’m convinced she’s a total badass, especially when it comes to a good bit of subtle subterfuge. Nearly as much as their actions themselves, the fashion choices of public figures are often scrutinised by discerning members of the public. And you can’t really get much more public than Her Majesty the Queen. Disclaimer: unfortunately, this article also contains other public figures and their fashion choices, notably Donald and Melania Trump, but I think you can guess which way we’re going with this. 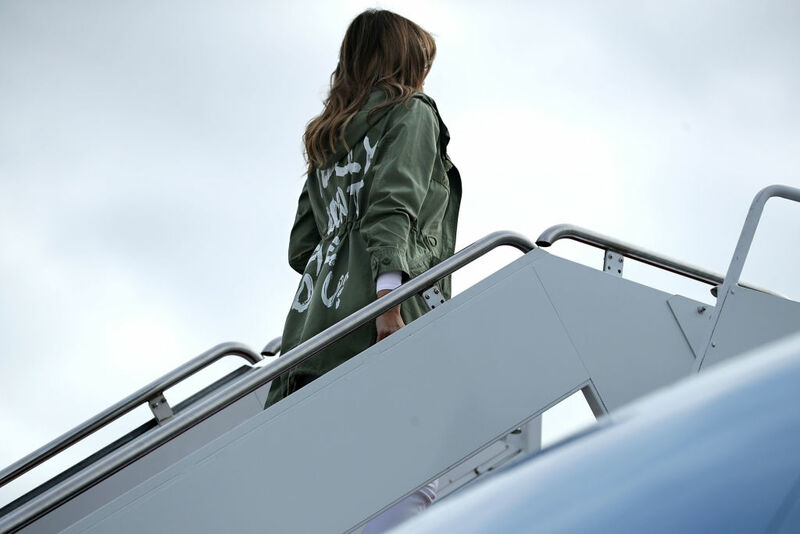 After the truly misguided choice of wearing a jacket that said ‘I Really Don’t Care’ while visiting immigrant children, Melania Trump came under serious fire. Then there’s The Donald’s fashion choices. Or should that be choice? When he’s not on the golf course, we really only ever see the Donald in a navy suit and tie. However, he somehow always manages to look just a bit scruffy, as if all his other, well-fitting suits were dirty and he’s in his back-up that was dragged from the back of his wardrobe and hasn’t been worn for years. The sleeves are never the right length, his tie is as wide as a bike lane and the trousers are baggy as MC Hammer’s. I know people joke about his tiny hands and feet, but the suits do him absolutely no favours. 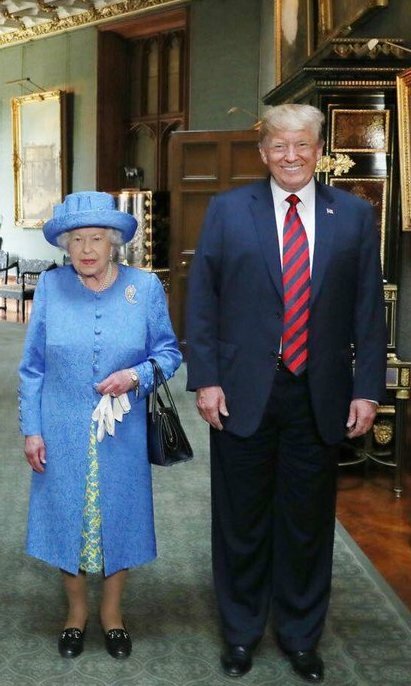 By the way, when you’re the President of the USA and you meet the Queen for the first time, iron your trousers, do up your jacket and don’t stomp around right in front of her! Which neatly brings us back to the Queen. 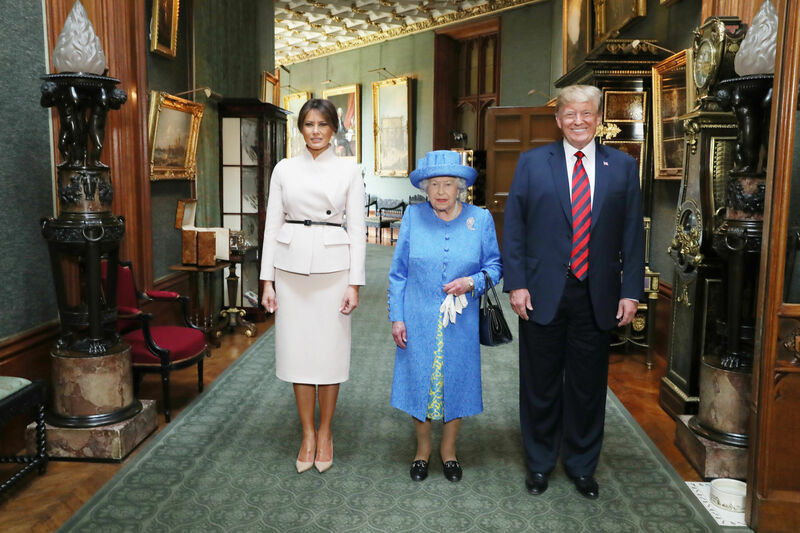 Eagle-eyed followers have noticed that, through the three times the Queen met with Trump during his recent visit to the London, she wore three different brooches with three different meanings – and three likely messages to the Donald. As Twitter user @SamuraiKnitter pointed out in this handy thread, the first brooch she wore was given to her by Trump’s predecessors the Obamas as a gift and a symbol of their friendship. 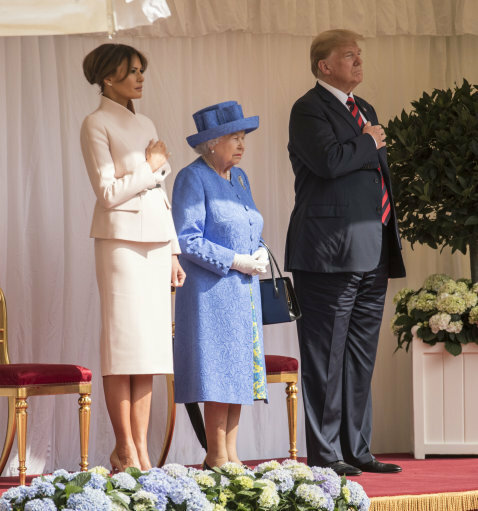 On the second day, the Queen wore a brooch given to her by Canada, America’s neighbours and a country which Trump is less than pleased about, as The Guardian points out. It was also in the shape of snowflake – a classic Trump-ism for people who disagree with him. Then on day three, the Queen chose to wear a brooch she also wore to her father’s funeral, so it’s probably not one associated with happy times for her. Take that Donald. You may have hair that defies the laws of science but we have Her Majesty and her fantastic brooches. This isn’t the first time the Queen may have sent a subtle message out, either. Appearing at the House of Lords last year amid the (still ongoing) Brexit talks, she wore a royal blue hat with a few yellow flowers in it that, incredulously, resembled a certain EU flag. As we know, the royal family aren’t allowed to express personal political beliefs, and all this may be reading way too much in to everything, but still, I’m hopeful.